Corner Cantina, Spring St. Bar, Library Bar, The Fountain and Beelman’s will all be showing the game. Corner Cantina, Spring St. and Beelman’s will be showing with sound! If you’re looking for a delightful, pre-game boozy brunch, The Henry is an ideal place to spend your morning on February 3rd. Your charming, go-to neighborhood spot from coffee to cocktails, The Henry has a tableside Bloody Mary and mimosa cart and brunch from 9-3 on Sunday. Enjoy dishes like Smashed Avocado Toast (crushed egg, farmhouse cheddar, buckwheat, everything spice) and Rancheros Breakfast Bowl (sunny side up eggs, tomatillo-pumpkin seed salsa, corn tortilla, refried lentil, avocado, tomato, queso blanco). You’ll be ready to cheer on your favorite team! With giant plush booths and over 25 flat-screen TVs, 40 LOVE is the perfect neighborhood sports bar to cheer on your favorite team or grab a bite to eat with friends. The space is filled with dark wood, lush greenery and white brick—characteristic of a classic American country club. A sunny patio stretches around the front of the building, making 40 LOVE a premier destination to sip handcrafted cocktails anytime of day. The menu has something for every taste from top-notch bar fare to healthy food options. Playful in nature and vintage in décor, 40 LOVE is a lively hangout to catch the game, soak up the California sun with a drink or challenge your friends to a game of shuffleboard. Photo Courtesy of EMC Bowery. If you’re looking for an unusual place to watch the game, look no further than 3rd Street’s Toca Madera. From the visually stunning design to the award-winning menu, Toca Madera transports you to a world that’s both modern and timeless. Enjoy brunch on Sundays from 11am-4pm and weekend happy hour from 3pm-6pm while you watch the game. From the churro waffle (waffle-pressed churro batter with mixed berries, chantilly crema, honey butter & maple syrup) to the Mexican omelette (sautéed fresh farmers’ market vegetable omelette with verde & roja salsa), there are many delicious ways to cheer on the Rams. Los Angeles-based D’Amore’s Pizza is celebrating our very new home team with a Super Bowl Party Special available at all D’Amore’s locations in LA! On game day, order: Jumbo 2-topping pizza, buffalo wings, and drinks for two for just $30. If going out is not your thing, consider hosting a party at your place! Since the game is at 1:30 consider a boozy brunch with Ruffino Rose orProsecco and Kim Crawford Wines. Both light, crisp, and refreshing and sure to be a hit at any party! If you're looking to spice up the bar area, go for Casa Noble Crystal Tequila. 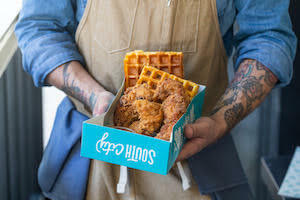 Head to Corporation Food Hall in DTLA’s South City Fried Chicken for the ultimate take-out package. $1 Oysters, $1 Wings andHandcrafted Pitchers of Cocktails inspired by the two competing Super Bowl 53 teams ($45 each) which serve up to four guests - sign me up! Preux & Proper has some pretty amazing deals all day long! Bring on the Southern hospitality this Super Bowl Sunday at the preeminent Preux & Proper in Downtown, Los Angeles. Keeping the Southern theme, as Super BowlLIII takes place in Atlanta, Georgia, there is truly no better place or a more Southern home on the West Coast to gather for this all-American tradition. Featuring 4 TV’s, there is room for everyone to find a good seat and cheer on the two championing teams. Kickoff this Sunday Funday with Sunday Brunch served from 12:00 noon to 4:00 pm and stay for the epic game.